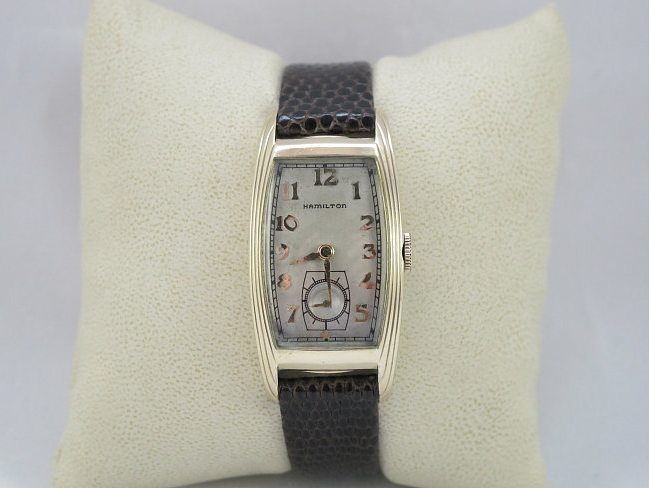 I think the "cat daddy" of the Hamilton curvex line up is the 1938 Linwood. I don't know the production stats but I believe it is also the rarest model in the line up as well. The Linwood has a steep curve to it and it's a fairly long watch at 43mm lug tip to tip... even longer if you take the curve into account. It's surprisingly comfortable on the wrist though. You would almost expect it to dig into your skin - it's that curved. 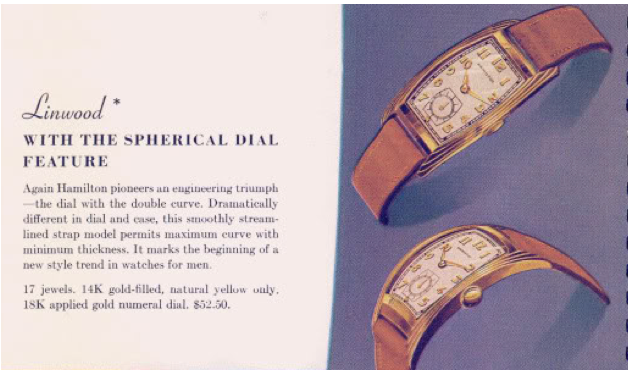 One of the very interesting facets to the Linwood is the "spherical dial". The dial curves in both directions as if cut away from a sphere. The dial is sort of an elongated barrel shape and the seconds register is also barrel shaped. The Linwood dial has a gold star at the number 6 position and you will often (seems more times than not) see that the star is missing on Linwoods and either have nothing at all at 6 or maybe another marker like a round dot. Produced for four years, you'll find the Linwood with two different movements. Early models will have the 17 jewel 14/0 sized 980 movement under the hood as the 982's were used only in the solid gold models. 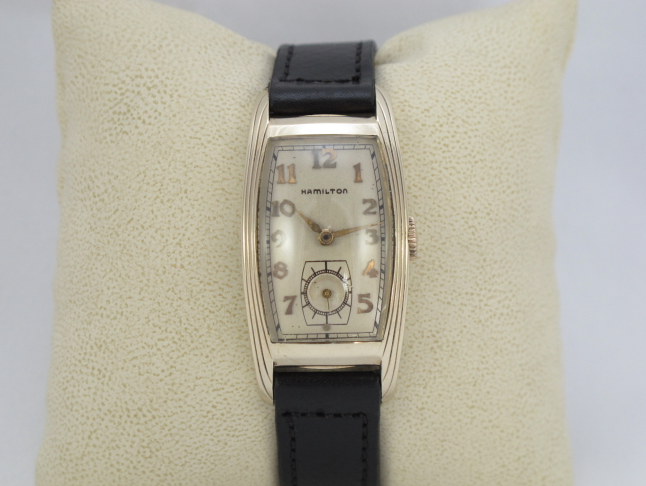 In 1940 Hamilton introduced the 982M (medallion) movement and the higher end gold fill watches like the Linwood got the 982. The 14K gold fill case came only in yellow. The stepped sides add a dramatic flair to the case and it's a real eye-catcher. The case can often be found with a lot of wear to the lug tips where the case comes together in four sharp points. Gold loss to the front bezel near the crystal corners is also fairly common. Usually it's the back that takes the beating though. The Linwood is an excellent Hamilton watch and certainly one of the crown jewels of any collection lucky enough to have one. Here's another one I recently completed as a project watch. 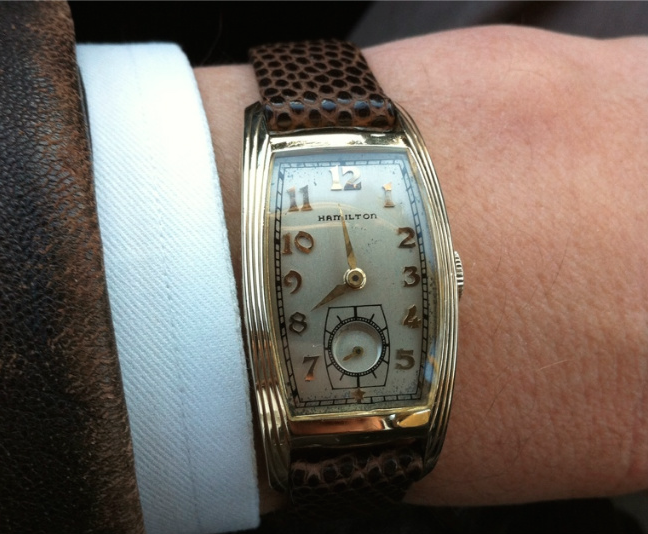 It has a very nice original dial.